Lo and behold! This young Mr. Pocket turns out to be the VERY same pale fellow that Pip fought back at Miss Havisham’s Manor House: Herbert Pocket. Once they realize they have met before (with their fists), they burst out laughing, shaking hands and forgiving each other. Herbert describes the situation to Pip: Pip’s temporary bedroom is furnished with rented furniture (at Pip’s expense), the dining table is set with rented tablecloth and dishes from the coffee-house (at Pip’s expense) and the food they will be eating will also be at Pip’s expense. It’s just for a few days though. Then he’s off to… well, somewhere else! We’ll find out soon. 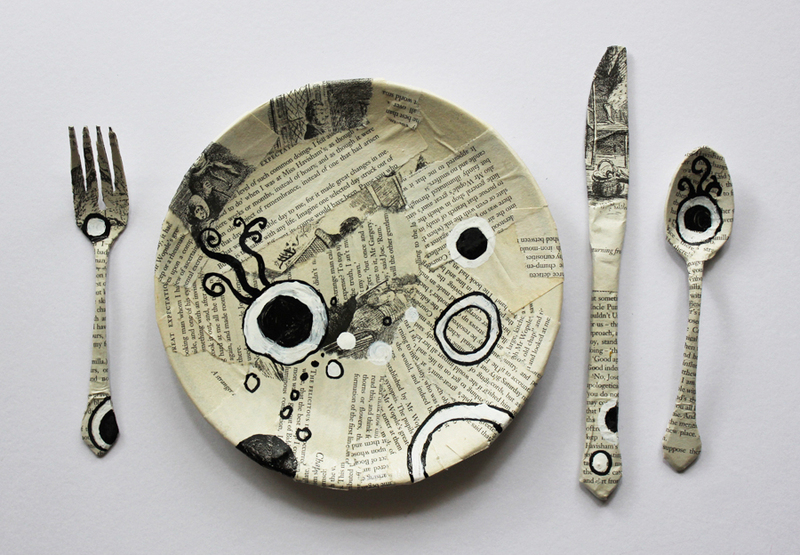 I covered a plate and silverware with book pages from my copy of Great Expectations (earlier pages which I’ve already read, of course). Then added some acrylic paint doodles. It was just too plain without that touch. Thanks! I wish I could move a little faster on it… this whole project. It’s taking me a while, life just gets in the way! But it has been fun along the way. As it always does….yr blog is the most interesting,entertaining and original that i have seen……Keep at it ,it is wonderful…………………..